The GQA Conference has once again proven to be a great success. 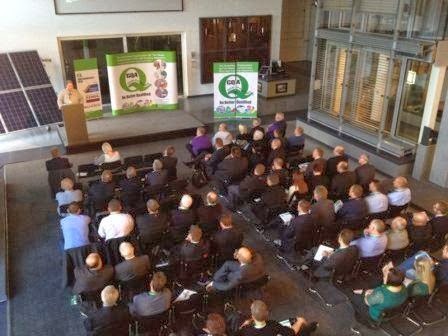 After months of preparation the conference took place on the 21st November at the Schueco Network Centre in Milton Keynes. We also ran a general workshop which gave delegates the opportunity to talk to GQA and other various organisations which included Fensa, Mytrade TV, Quals Direct and FiT Events. Delegates listened in interest to keynote speaker James Ayling of the National Apprenticeship Service gave an update on the future changes to apprenticeships. All in all the conference went well and feedback on the event has been excellent and has shown that the GQA network of centres appreciate the opportunity to listen to key note speakers, attend workshops and to network, sharing practice and potentially creating new working partnerships. GQA would like to thank our sponsors FENSA, Assure Windows & Doors and Schueco for their support and sponsorship of the event and special thanks to speaker James Ayling and presenters Kevin Smyth, Austin Green, Jon Bray and Andy Carrington for delivering informative workshops.